I wasn't always on-board with the chia pudding trend. There was just something strange about the semi-crunchiness of the seeds mixed with gelatinous texture that I couldn't quite get down with in the beginning. However, with enough flavor & time in the fridge, the texture is smoother and allows me to focus on how delicious it is. I've tried many variations of chia seed pudding, but this recipe is a winner not only for it's flavor, but amazing health benefits as well! What's the big deal with Chia Pudding? So, let's talk about why chia seed pudding (or chia pudding, as I'm calling it here) is so trendy right now. Chia seeds are a great (& gluten free/GF!) way to get a boatload of nutrients like fiber and Omega-3 fatty acids. They help do things like regulate blood sugar, lower cholesterol, and keep you filling fuller longer (snack attack queen right here needing all the help she can get). When creating this recipe, I knew I wanted to put ingredients into a chia pudding that would not only be sweet & satisfying to taste, but also help with our anti-inflammatory needs during these hot summer months. I can use all the help I can get amongst the heat & allergens of the South. Even though our heaviest allergy season is technically considered over, my allergies have actually been worse than ever. The idea of incorporating turmeric more into our western diet thrills me because I actually love the bright yellow color it gives dishes, it's golden flavor, and of course, it's amazing anti-inflammatory benefits. 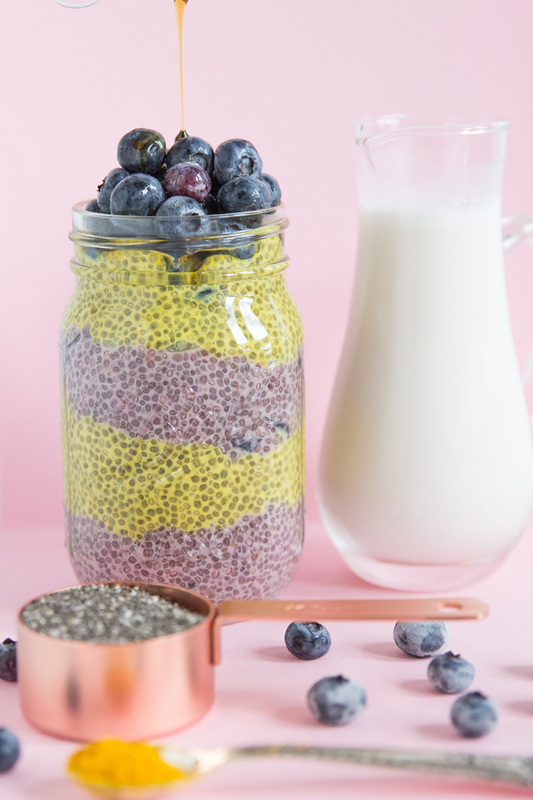 This chia pudding recipe is not only excellent for you because of the anti-inflammatory properties of the turmeric powder but also because of the yummy blueberries containing potassium, folate, and vitamin C.
Now, you may be thinking "but isn't turmeric is a savory flavor?" and indeed, friend, it is. However, when mixed with vanilla coconut milk beverage and maple syrup, it really isn't very distinctive amongst the other flavors, especially the blueberries. I did not use the type of coconut milk out of a can (thick in consistency - often used in curry dishes or as vegan whipped cream replacement). I used a SO delicious brand of "coconut milk beverage" in this recipe and photo above. However, you could substitute almond milk, rice milk, hemp milk, or any other type of dairy-alternative milk beverage you like for the recipe. I chose the coconut milk variation because I wanted the coconut-y flavor the milk gave this recipe. Bottom line: I wouldn't recommend buying the canned coconut milk for this recipe. Whew, OK, glad we cleared that up. Collect 2 separate mason jars, glasses, or bowls. In another jar or bowl, mix 1/2 tsp. turmeric, 1 cup. coconut milk, 1/4 cup chia seeds, and the other 1/2 tbsp of maple syrup. You'll probably want to use a fork to whisk all these ingredients together so that the turmeric doesn't clump. Place both jars/bowls in the fridge and let them set overnight (or at least 6 hours). I also like to wash and freeze a handful of blueberries to top the final pudding (so refreshing!). Take a new, clean jar or some type of clear vessel and layer portions of each the blueberry and turmeric chia pudding, so you get a pretty little work of art like the below. Then, I top with a pinch of sea salt (brings out the sweetness), a handful of frozen (or not) blueberries, and a final small drizzle of maple syrup before serving or diving in. You could also throw on some raw coconut shreds, walnuts, or any other type of berry you'd like to invite to the party! That's it! 5 ingredients and only minutes of night-before prep to enjoy this delicious treat. Do you all enjoy chia pudding? Have you made any before? If so, let me know what flavor combos you like below, so I can switch it up and try another variation! Here's to pretty summertime treats that keep you healthy & happy... Cheers! *If you don't like the idea of muddled chunks of blueberry in your chia pudding, you can always add all the same blueberry layer ingredients (minus the chia seeds) to a mixer, mix well for 10-15 seconds, add the chia seeds and pop into the fridge. ** I had help with my extra pop of purple in my blueberry layer by adding 1 tsp. of beet juice to the layer. :) Beets + beet juice make a beautiful color.